The cradle of Saxony. Meissen was spared from serious destruction during the two world wars. Picturesquely situated on the River Elbe, the city’s history goes back over a thousand years. Witness the world famous porcelain manufacture of the “white gold” – the Meissen porcelain. The hunt was the greatest of the courtly passions which is why the baroque hunting lodge of Augustus the Strong is surrounded by an impressive park with a game reserve. 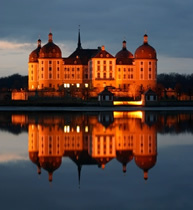 You will also discover the “paradise in a nutshell”, the little pheasant castle, and a lighthouse in the middle of Saxony. On top of one of the most prominent table mountains in the Saxon Switzerland is situated the fortress Königstein. The construction covers an area of 9,5 hectares and is one of the most monumental of its kind in Germany. It is also home to one of the most significant open-air museums in defence history. Thereafter we will visit the Bastei which has a unique view over the Elbe valley. Trade fair city, university city, city of Johann Sebastian Bach and books. Beautifully refurbished passages, trade fair court yards and residential homes shape this city. In Auerbach’s Cellar you can walk in Johann Wolfgang Goethe’s footsteps and discover the hidden memorial dedicated to the building tycoon Schneider. Also outside the city centre one can enjoy many fascinating sights: the farmhouse where Friedrich Schiller supposedly composed his “Ode to Joy”, the Zoo of the future, refurbished industrial monuments and the Monument to the Battle of the Nations. In front of today’s visitors the castle rises majestically on a precipice over the Müglitz valley. Over 700 years of building, demolition, reconstruction and preservation have bequeathed a castle, with a structure combining all the styles from Gothic to Classical within its walls. At the feet of the palace you will find a beautiful park. Embedded in tree-covered mountainsides, a seemingly untouched nature and the formally arranged and inspired by the French style gardens form a charming contrast. The permanent exhibition invites you to a journey through Saxon history. In Görlitz you cannot walk without tripping over stories and history. 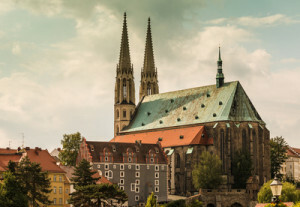 Today, the easternmost city in Germany, Görlitz was once the powerful centre of Lusatia, a leading member of the union of the Six Cities and Towns as well – located on the Via Regia – a thriving commercial center of the Middle Ages. The tour leads from the narrow streets of the old town within the limits of the old city wall up to the shopping and business district and the large Art Nouveau train station.